Successful high performance thinkers and creators understand the value of failure. In other words, his failures were a form of success. So how did Edison do it? How did he become one of the most prolific inventors in history? In a word, attitude. I find out what the world needs. Then, I go ahead and invent it. Edison had a rare quality—resilience. Objects like rubber balls have resilience, the ability to spring back into its original shape. Humans who are resilient have a strong capacity to recover quickly from difficulties, or in Edison’s case, from failures. How did he do it? He simply did not recognize failure. And this is how the innovators at my Silicon Valley company thought. Fail faster means recognizing that when you are innovating, creating something new that’s never been done before, it is a natural fact that you have to move through a number of “failures” to get to success. Failures are the norm for successful people. They do not see failures as stumbling blocks. They see failures as stepping stones. This entry was posted in 01. Creating Your Life on May 6, 2018 by Mark. From the book, Mozart and Great Music: What You Should’ve Learned as a Teen, Book 4.
but that it is too precise for words. Contrary to popular belief, truly Great Art (such as that created by a Shakespeare, a Mozart, a Michelangelo, a Sesshu, an al-Mutanabbi) is more objectively great than most people realize, not just a matter of subjective opinion. True, some people have preferences that may exclude Great Art. They may even have profound, sublime experiences with the works of artists that appear simplistic and trite to others. Pachelbel’s Canon can be moving and beautiful. What makes Great Art great? The answer, paradoxically, points to how Great Art induces in someone rare and powerful subjective experiences. each time one experiences it. Great Art embodies an eternal mystery. Great Art catalyzes, transforms, and transfigures. And more often than not, Great Art requires you to meet its demands before it unlocks its transfiguring mystery. People who have never tried to meet the demands of Great Art (through education or training), or who have tried but stopped before the door opened, may call all art a matter of opinion. They may believe it all to be mere preference, without one preference being greater than any other. Pachelbel’s Canon in D may provide extraordinary pleasure for some, but it cannot possibly be defined as Great Art. The same can be said for most popular music today. Don’t get me wrong. I spend more time listening to popular music than music that is Great Art. I love jazz, pop, ambient, rock, metal, alternative, and many genres beyond and in between. I love The Beatles, John Coltrane, The Cars, Evanescence, Brian Eno, Ella Fitzgerald, Enya, Led Zeppelin, U2, Al Di Meola, Fever Ray, Robbie Williams, Devin Townsend, Steve Morse, Yes, Cirque du Soleil, Jon Mark, Peter Murphy, Rodney Jones, Larry Siegel, Dean Martin, Todd Rundgren, Adele, Blue Oyster Cult, Keith Jarrett, and many more artists. Or the achingly beautiful 2nd movement of Mozart’s Piano Concerto No. 21. This video with an animated graph helps you “visually hear” the individual instruments. These pieces of music have been played so much that, as beautiful and profound as they are, they have almost become cliché. So we will focus on other music, less popularized, to achieve some freshness in recognizing Mozart’s heavenly beauty. would all gather in huge rooms. The great conductor and pianist Daniel Barenboim gives us in these two short videos a description of how to begin telling the difference. The aim of this book is simple—to give you a direct personal experience with a heavenly state of consciousness while listening to Mozart’s music. Or if you already have access to Mozart’s heavenly mansion, to provide you a glimpse into more rooms within that mansion, with greater appreciation. Fortunately, YouTube provides all the musical examples we need to unlock the doors to the mansion. Throughout this book, I will link to YouTube videos that offer inspired performances. And inspired performances make a difference. and a dictionary definition of heaven. Listening to inspired performances is crucial. Not all recordings are inspired. Not all do Mozart justice. But lucky for us, intrepid lovers of Mozart have made available many of the performances I had hoped to find. But be aware of the limitations. in a great concert hall or chamber venue. Next best, on a great sound system in stereo. Or on headphones. Therefore, YouTube can only offer a small experience of that heaven. Be prepared to track down and purchase inspired recordings, recommended by me or by some of the guides listed in “Recommended Readings and Recordings” near the end of the book. Chapter 1: Why Is Mozart Great? surveys what people from several professions think of Mozart, indicating a broad appeal. Chapter 2: Hearing Mozart, Part 1: Serenade No. 10 for Winds, “Gran Partita” focuses on one piece of chamber music to illustrate how Mozart provides a harmonic approach to music rather than a purely melodic one. Chapter 3: Mozart—The Child, the Myth, and the Man details his childhood accomplishments while also subverting the man-child myth. Chapter 4: Hearing Mozart, Part 2: The Magic Flute, Overture extends the idea of listening to Mozart differently in a harmonic, multi-level way, even when he is composing something especially melodic. Chapter 5: Mozart’s Piano Concertos covers some of Mozart’s greatest contributions to music, pitting a solo pianist against an orchestra, foreshadowing a composer like Beethoven who extends the distinction even further. Chapter 6: Hearing Mozart, Part 3: Sinfonia Concertante in E-flat introduces the idea of musical rhetoric, and classical music as oration and conversation. Chapter 7: Mozart’s Chamber Music: “A Blessing of Inconceivable Richness” strives to illuminate Mozart’s incredible range of music for small ensembles: sonatas for two players, trios, quartets, and quintets. Chapter 8: Hearing Mozart, Part 4: Singular, Idiosyncratic, and Special-Occasion Gems surveys a range of unusual compositions that illustrate Mozart’s wide range of musical interests. Chapter 10: Hearing Mozart, Part 5: Symphony No. 40 in G minor dives deep into a symphony regarded as Mozart’s finest. Chapter 11: Mozart and Opera: Le nozze di Figaro (The Marriage of Figaro) touches on his seven great operas, with the great The Marriage of Figaro as the main attraction, thought by many to be one of the finest comic operas of all time. Chapter 12: Mozart’s Heavenly Mansion provides a special listening session of heavenly musical architecture. Next you will find “The Mozart and Great Music Checklist” and “Recommended Readings and Recordings.” There is also an appendix that offers a compilation of links to online resources for audio and video recordings. Several chapters include an “Extended Discussion” section for readers interested in going more deeply into a particular piece of music or some other musical fundamentals. The recommendations in this book, faithfully applied, do deliver. They will help you experience Mozart’s heavenly music in ways that may transfigure and transform you. So let’s begin this marvelous and very dear musical adventure. This entry was posted in 04. Mozart and Great Music on September 8, 2015 by Mark. Your mind has a powerful filtering system that creates blind spots. Have you noticed how when you read a book and the story fills your imagination, the outer world begins to fade away? You don’t hear the traffic outside or someone calling for you. They have to speak more loudly just to get through to you. Have you noticed how you can be at a party with everyone talking and you can hardly understand what anyone is saying? But when someone mentions your name, that gets through to you? Have you noticed how when you fall asleep your senses slowly shut down, your body loses sensation, and then you are off to sleep? Then almost nothing gets through to you? Our senses take in 11 million pieces of data in each moment, but we can only consciously process up to 40 pieces per second. 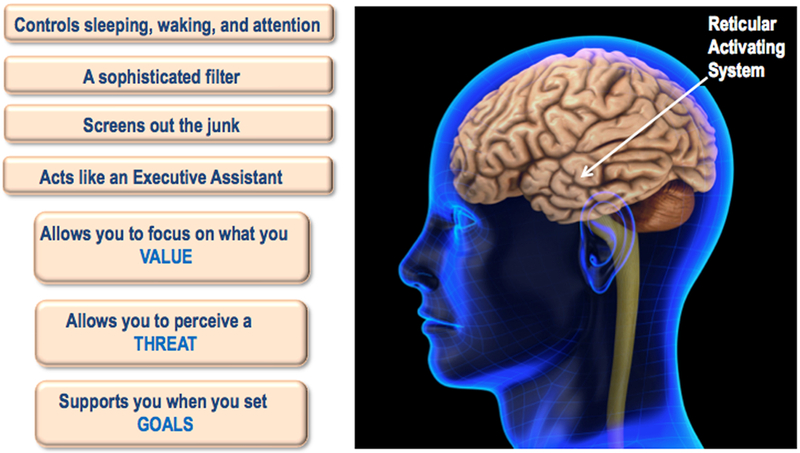 The part of your brain working as a filter to manage sense perception is called the Reticular Activating System (RAS). If the mind didn’t have the RAS, you’d go crazy. Think of all the information coming in through all your senses. The sights, the sounds, the tactile sensations. Think of all those little hairs on your body. If you focus on any part of your body, you would become aware of the sensation there. The RAS is a network of cells in the center of the brain associated with waking, sleeping, attention, and focus. It physically filters irrelevant sensory input. The RAS allows you to focus. It functions like an executive assistant, a kind of censor of what’s not important. It screens out the junk. or what you think is a Threat. As we focus on something important, things that are less important, things that we Devalue, fade away. Important information gets through, whatever we consider valuable or threatening. This explains why teenagers can be watching TV or playing a video game, and a parent can call them to dinner and not be heard. The Value of the parent’s voice goes down in proportion to the importance of the TV. This explains why eight people at a large dinner table can have cross conversations with each other and still carry on. As you focus on something important like your own conversation, the others nearby fade because they lose Value to you. This explains why a new mother sleeps through the alarm clock going off, the jet flying overhead, and the truck driving by, but when the baby starts crying, she wakes up right away. The other sounds are not a Threat so they don’t get through the censor, but the threatening sound of the baby gets through. What you Value gets through. What you Devalue gets filtered out. I knew a couple with a barking dog that kept half the neighborhood awake. The owners were never bothered by it. However, the barking threatened the neighbors’ peace of mind so it got through their mental filter. But the owners loved their dog and were comforted and felt protected by its barking. They would have no problem sleeping through the night. Their neighbors may also have slept better if they understood that any burglars in the area would be warned off by a barking dog. Once I worked at a company that decided to move my group to a different building. I was placed next to a service elevator. You can imagine what that means. All day long, every day, I would hear that elevator opening and closing, opening and closing. And almost from the beginning my RAS screened it out. It never bothered me. A colleague who used to have an office was now in an open cube. He did not know about the RAS. He was used to closing the door and having quiet. Every sound was a threat to him, so every sound got through. The key is knowing that you control what gets through. This fact is particularly important to teachers. How often do we accuse a child of not paying attention to the teacher? But what if the teacher is not making the history lesson, or math lesson, or science lesson interesting to the child? What happens when the child sees no Value in what the teacher is saying? The child’s RAS screens out the teacher. It’s the teacher’s job to make sure the class material is perceived as valuable by the child. So the question is, what do you Value in life? And what do you Devalue? Because now you know that if you devalue important things, they will not get through your mind’s automatic filter. Could what you Devalue actually hold Value? How will you know if you are blind to it? This entry was posted in 01. Creating Your Life on August 3, 2015 by Mark.